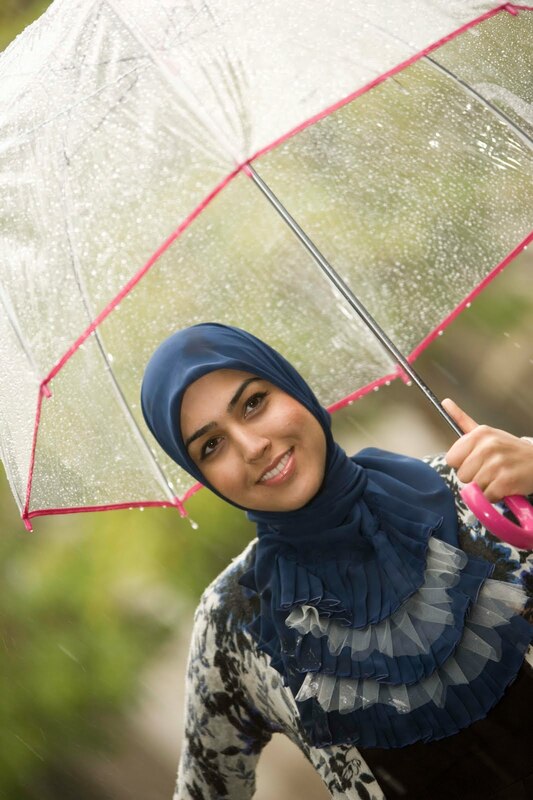 Vela Scarves is a US-based company, which provides handmade scarves designed by Marwa Atik. The scarves are not your usual designs though - most incorporate intricate embroidery, ruffles and beading for a truly unique product. You can find out more in an interview with the creative talent behind Vela here. Today's review is for the Fish Scale square scarf. The scarf arrived in a cardboard airmail box, inside of which the scarf was wrapped in black tissue paper, with a little Vela logo sticker, and a leaflet about the company. Fish Scale is classed as a square scarf, but itself comes already folded and sewn into a triangle, with the ruffles on one end. 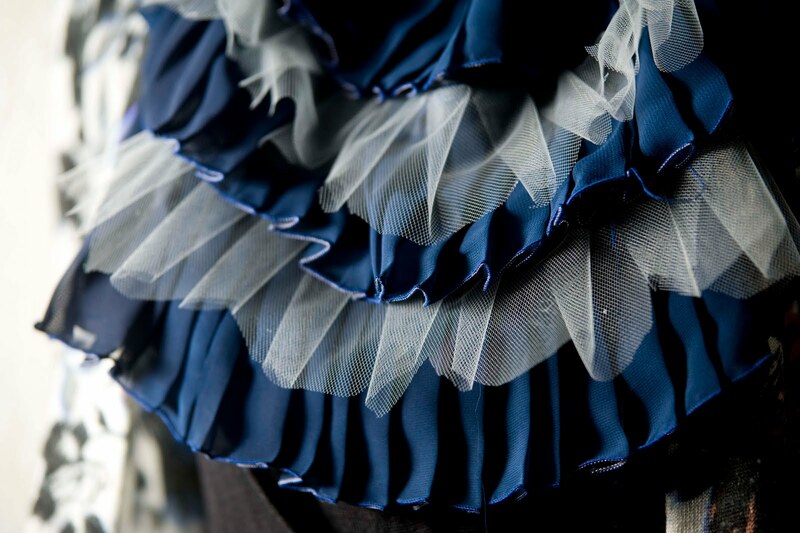 The ruffles consist of three layers in the same fabric as the rest of the scarf, with two layers of a grey tulle in between. The scarf is finished off perfectly, and fully hemmed all the way round. The fabric is a very soft, lightweight chiffon, but is also quite slippery, so definitely needs to be worn with a cotton undercap. Washing instructions also state that is must be dry-cleaned only. The Vela video tutorials provide ample guidance on how to wear the scarves; pin underneath the chin, the plain end is wrapped around the neck, then the end with the ruffles is brought over the chest, and the two knotted together. This does take a little practice to get perfect, but the effect is gorgeous! I did find however, that the ends were still quite long when wrapped around, and there was a lot of fabric left hanging after they were tied together. But I do love the fact that the scarves are designed so as to provide plenty of coverage at the front, which is great for tops with slightly low necklines. I love the unique design of these hijabs, and the Fish Scale scarf in particular is great for adding an elegant touch to outfits when you want to dress up a little, but not too much! The scarf is quite slippery though, and will require a few pins to keep in place. For those who are not usually square scarf wearers, these do provide a great alternative by having extra coverage at the front. I'm happy to see that they've taken to finishing the hems on their ruffled scarves.. I purchased one sometime last year and was slightly disappointed by the quality. The hems weren't finished and fraying at the edges - perhaps it was intentional, but after even a gentle wash it got out of hand. I had to burn and wax the edges myself so it'd stop comin apart! So beautiful! I, too was a bit worried about fraying-—I saw a loose thread in the photo--but I'll take you at your word. Rough, unfinished hems seem to be what's popular these days… I can get that look by sewing my clothes for free! OMG, this is like one of my favorite scarf wrap styles. It seems so easy but I never managed to do it the right way. Thanks so much for the tutorial!